Bali, between Rethymno and Iraklio, is a beach resort. In recent years, Bali has grown a lot and become a popular resort for families, thanks to its excellent beaches. There’s very little traffic - the road going into Bali is a dead-end. The nights are pretty quiet here, since there are no nightclubs. Most tourists here come from Germany and France. Bali has excellent bus connections, but the bus stop is 2km out of Bali on the motorway. 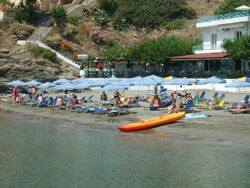 The tourist town Panormo is only 10 km away, the resort Agia Pelagia about 30 kilometers. In the area is also the interesting Cave Meldoni. Beaches in Bali Crete: Don’t mistake Crete’s Bali with its Indonesian namesake! The beaches here are very nice. Some beaches are congregated around the little port in the town centre, and the bay itself is well-protected against waves, giving the sea a calm nature, almost like being on a lake. 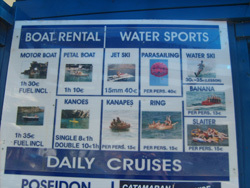 You can rent all kinds of water sports equipment: pedal boats, canoes, water skis and so on. Experienced swimmers can swim to the small islands just off the coast. There is a much larger beach out of town in the direction of the motorway. Accommodation in Bali: Bali is popular with package holiday tourists and independent travellers. 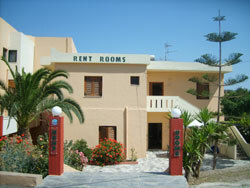 Anyone who arrives without a room already booked can expect to find a room from €25. In the high season (July and August), room availability is lower and prices often higher. 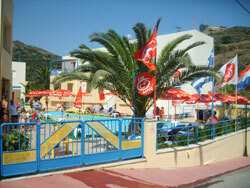 Some hotels such as Kid’s World (right picture) specialise in catering for young families. Eating in Bali Crete: Around the port in the town centre there are lots of restaurants. Many of them serve snacks in the daytime to people enjoying the nearby beaches. Prices vary from place to place. A hamburger with chips can be €2.50 – or €5 in a neighbouring taverna. My personal favourite in the port area is taverna Akrogiali, which serves up cheap, simple main courses such as spaghetti in tomato sauce or fish fingers for less than €5 in 2007. They also do good Greek cuisine. If you walk a few hundred metres away from the port, the prices of restaurants and snack bars drop by 10-20%. There are some supermarkets in Bali, but they are not cheap, and some items are absurdly overpriced. Buses an other transport in Bali Crete: There are hourly buses to both Iraklio (one hour away) and Rethymno (30 minutes in the year 2019). Unfortunately, the bus will only drop you 2km out of town, although there are rumous that this situation will change soon and some buses will drive the extra 2km to Bali. In Bali itself there are road trains for the tourists, which are not too expensive (about €2 one-way or about €5 day-passes in 2019). 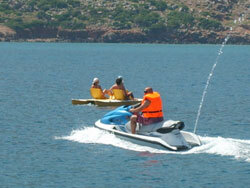 From €25 you can book an all-day boat excursion to Rethymno and other places.